Photos by Glad Works Inc.
CarMAX is one of the biggest used auto retailers in the United States. Now a Fortune 500 Company, the first CarMAX was opened in September 1993 in Richmond, Virginia with an inventory of 500 vehicles. 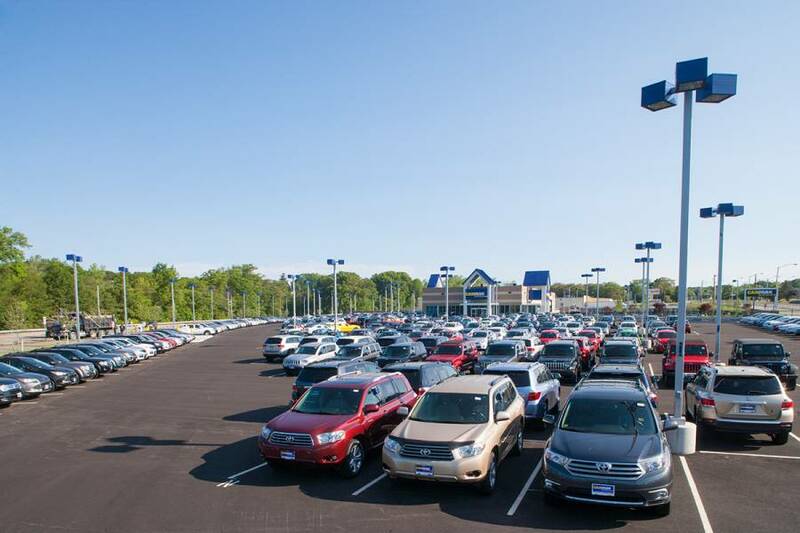 Today CarMAX has over 100 locations throughout the country with over 4 million vehicles sold. The CarMAX superstore located on the city line of Cranston and Warwick, Rhode Island at the former Building 19 location underwent an expansion. The project included a new 15,664 square foot building, a stand-alone car-wash, 197 customer parking spaces, and a 410-space sales lot. DiPrete Engineering completed an ALTA/ACSM Land Title Survey and a Class III Topographic Survey. Site engineering for the facility included stormwater management, site grading, and utility design. Local and state permits were obtained through both the City of Cranston and City of Warwick. RIDOT permitting was required for a new freeway line break for the test drive entrance. RIDEM permitting was required for improvements located within the 200 Riverbank Wetland and FEMA Flood Zone.